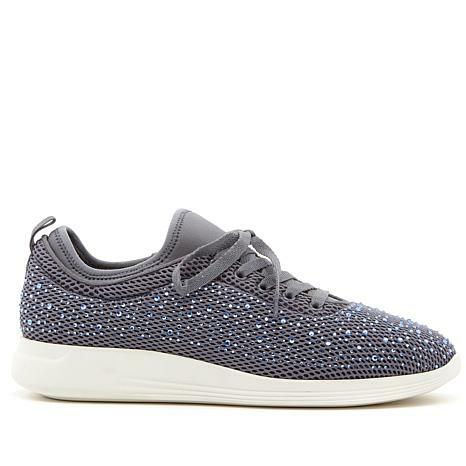 Be glamorous even on casual days when you wear these high-fashion sneakers from Steve Madden. 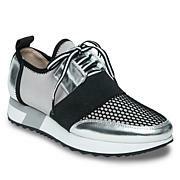 Breathable mesh fabric embellished with sparkling rhinestones gives the classic lace-up shoe a fashionable edge. 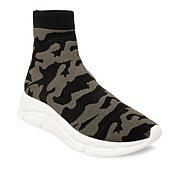 Plus it has a fitted sock liner that makes slipping them on a piece of cake. With comfort this chic, you'll make going to the grocery store a stylish event. What a comfortable shoe and I love the little bit of sparkle. The shoes are well made with a good sole, and look adorable with jeans or a casual skirt. Fabulous buy, too! These sneakers are so comfortable and beautiful . The stones on them, really stands out with sparkles, etc.. I got them a half size smaller than what I usually wear and the fit is perfect. I took some of the reviews to heart and downsized, which turned out to be the right move. 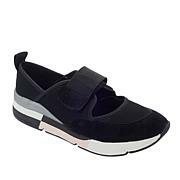 Very easy on my feet I am a hair stylist.My go to shoes when my feet hurt from standing. With all my foot problems, it is difficult to find comfortable shoes that are also fun. Beautifully crafted. Comfortable and light weight for warm weather. Enough cushion for workouts and just enough sparkle. I ordered bothe white and black.